It is a great honour for us to bestow this noble name on one of our varieties. Many free black Southern men of colour fought for, and defended, the South during the invasion. Unfortunately, very rarely today do these brave men receive recognition for their heroic sacrifice due to the many groups that have shamefully tried to hush their existence from the history books. So what better way to push history than through word of mouth and Southern strains? So sit right back, take a few tokes, and give props to our Black Confederate heroes for their contributions to Dixieland!!!! Deo Vindice! I always wondered what some black Confederate advocates were smokin’, but until now I thought that was a rhetorical question, not a literal one. But you kinda had to know this was coming, since back in the day the Confederate Jesus crew featured H. K. Edgerton’s picture on their home page. I never really thought of Edgerton as “pungent and fruity,” but maybe they know him better than I do. For those so inclined, you can pick up a free sample at the California Caregivers Alliance, 2815 W. Sunset Blvd, Suite 201, in the Silverlake area of Los Angeles. Just make sure you bring your current MMP card — this is a totally legit operation, y’all. 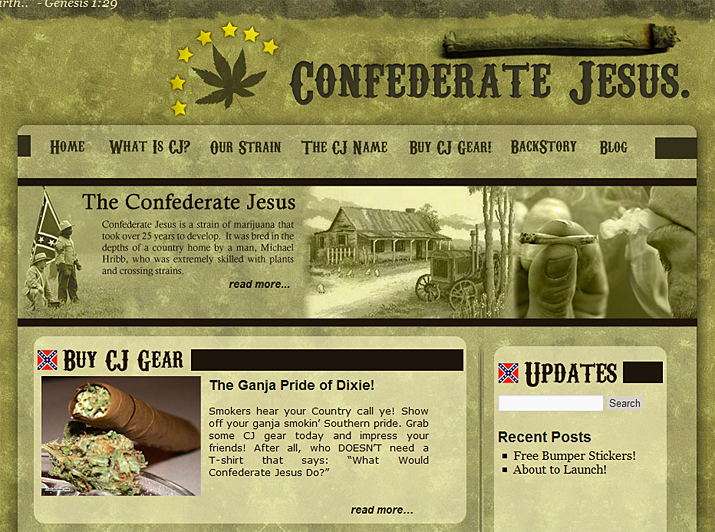 Image: “Black Confederate” strain, via ConfederateJesus.com. Andy; you ought to post this on the Civil War Talk board…. As you say, this explains a lot; Battalion must be smoking this most of the time…. “I always wondered what some black Confederate advocates were smokin’, but until now I thought that was a rhetorical question, not a literal one.” I’m pretty sure these folks cannot afford to lose any more brain cells. Reminds me of the song “Wildwood Flower” by Jim Stafford from sometime back in the seventies. Maybe it’s just me, but I have a hard time understanding why Black Confederates are evidently so important to the Heritage types. Even given their tendency to put a big thumb on the scale by defining military service so broadly it includes any slave who accompanied his master to war, the number of Black Confederates they can conjure up is hilariously miniscule compared to the hundreds of thousands who enlisted in the USCT. Is it somehow going to take the curse off the slavery/white supremacy foundations of the Confederacy, if they can only dig up enough Black Confederates? Like I said, the logic behind this proposition escapes me. It’s the 20th/21st century update of the Happy Slave myth. People do not like cognitive dissonance and they’ll twist themselves into pretzels to avoid it. While there are some hard-core types who will cheerfully tell you that the only thing wrong with slavery is that those interfering Yankee busybodies forced it to end and they don’t care whether or not the slaves liked it, there are many who have a vague sense that yes, slavery was a bad thing (or at least other people think it’s a bad thing and look down on the South because of it.) The idea that their revered ancestors started such a devastating war in order to protect the right to hold slaves is embarrassing. They are throwing spaghetti at the wall to see if something sticks: the war was due to tariffs, etc. and it wasn’t due to slavery. They think if they can prove that blacks fought for the Confederacy, then that is Exhibit A in their case. Personally, I’ve never believed that, even if they COULD prove that, it proves what they think it would. Many invaders find local collaborators, no matter how vicious the invader. so why shouldn’t slavery find at least a few collaborators among the enslaved? Also, the life and safety of blacks, enslaved and free, in the antebellum South were at the mercy of white whim. If given the opportunity, some might have joined to protect themselves. The fact is that the Southern whites saw no need to inquire of blacks what they thought about anything. Oh that reminds me i hve to aplly for a firearms licence so i can have a bb gun-totaly true!.